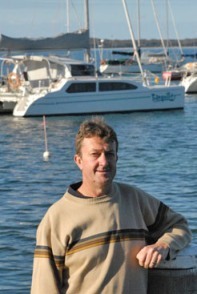 David Copley is a marine surveyor trading as Jervis Bay Maritime Consultants and based at Callala Bay. 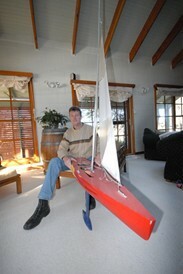 He’s been in the boating industry for 30 years, training as a shipwright on small timber boats at Balmain, in Sydney. Then at Mortlake he worked on the total restoration of the 100-foot steam pleasure yacht Ena (designed by the same marine architect who designed the ferry Lady Hopetoun, now in the Sydney Heritage Fleet). The Ena was steamed to Fremantle in 1987 for the America’s Cup. David’s library contains the hardcover book which tells the story of the Ena and her restoration. While David regards his time on the Ena project as perhaps the highlight of his timber shipwright career, he built his own carbon fibre and Kevlar 12-foot skiffs and raced them successfully at Australian Championship level in the 1980s. He left shipbuilding to work in his parents’ printing business during the transitional era when hot metal systems were replaced by offset technology. However, his interest in boats and sailing did not diminish. Then came the move to the Shoalhaven in 1993, where he had been owner-building a new family home at Callala Bay. This home exhibits features, finishes and special touches that can be traced to his shipwright training. David brought his 28-foot cruiser, Runaway, to Callala Bay, restored it and began charter work. His boatbuilding knowledge and experience came to the attention of legendary Shoalhaven boatbuilder/sailor Kanga Birtles with David working with Harvey Halvorsen at Kanga’s Jarkan facilities on tooling for a new line of Halvorsen 38-foot weekender cruisers. Patterns for the moulds for this vessel were developed from scratch. All design drawings had to be converted from imperial to metric as David carried out loft work for the first boat from which the moulds were then taken to be used in production. At the same time David was on contract with the Navy teaching sailing to RAN cadets at HMAS Creswell, on Jervis Bay. This work is continuing and is being combined with the marine survey business which David purchased. He gained his professional qualifications in marine surveying in 2004 through the Australian Maritime College, in Launceston, Tasmania. Those qualifications allow him to work on insurance claims and pre-purchase inspections. David continues his enclosed water sailing with Jervis Bay Sailing Club and his blue water sailing as navigator on the Northshore 38-footer “Tartan”. He sailed on “Tartan” in the last Sydney-Hobart then in the Sydney-McKay classic – and will participate in the Gold Coast race at the end of July 2008. But that’s only part of the Copley family’s Shoalhaven story. David’s daughter Georgia, 14 and son Lachlan, 9, are both into sailing – and loving the Shoalhaven lifestyle. They sail with Callala Bay Junior Sailing Club and Jervis Bay Sailing Club. Wife Serena also enjoys boating – the family recently sailed in the Whitsundays and there’s also the family’s “Runaway” on moorings off the Callala Bay jetty. David said he and Serena decided to get out of Sydney where they had lived near the water at Gladesville. The Shoalhaven provided not just the water focus, but also the wealth of business opportunities for Serena. She now runs her own restaurant, Trio Trattoria, in Kinghorn Street, Nowra, where she has been trading for 18 months. Trio Trattoria is one of the six finalists in Italian Restaurant category in the 2008 South Coast Restaurant and Catering Awards. The multi-category series is open to all restaurants on the Illawarra/South Coast between Helensburgh and Ulladulla. Trio Trattoria’s selection as a finalist in its first competition is significant for Serena because the section finalists include Italian restaurants which have been trading for up to 18 years. An only child, Serena had her introduction to the catering trade as a youngster, helping in her parents’ specialty cake shop at Marrickville. Serena went on to gain her Certificate IV in Front Line Management, managed restaurants in Sydney, became involved in party planning and virtually from day one in the Shoalhaven operated her own business. 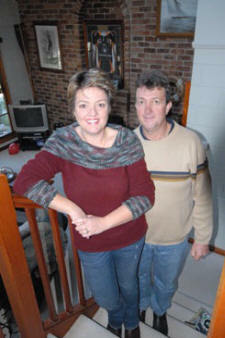 The idea for her first Shoalhaven business venture, she said, came to her “while washing up”. That was to start a homewares party planning operation from scratch by specializing in homewares. She and a friend each put in “a very, very small amount of capital” – yet built a business that eventually employed seven staff, established a retail outlet and sourced craft items ranging from timber products, and iron work to figurines from across the Shoalhaven with supplementary stocks purchased from importers. Her friend now runs that business. For four years from 1998 Serena also ran a family-owned café in Callala Bay – a seven days a week operation. Her latest venture, Trio Trattoria, is an elegant, Italian-inspired, fully licensed, 120-seat, family-friendly restaurant as well as an ideal wedding venue. “The kids can play the X-box while Mum and Dad enjoy a wine….and there’s live music on Saturday nights,” Serena said. Her Trio Trattoria team includes a chef and 10 casual staff, with Serena currently (July 4) advertising for additional staff. “I won’t ask staff to do anything I won’t do…they’ll see me sweeping the floors and washing up if that’s what has to be done,” she said. FOOTNOTE: Serena’s parents retired from the food industry 12 years ago. They followed their only child’s lead – and are now Shoalhaven residents living close by David and Serena so they can enjoy watching their grandchildren grow up.